Fall has finally arrived in Texas with temperatures dipping into…the seventies. The neighborhood is decorated with skeletons and tombstones, and the candy bowl – the one ready for trick-or-treaters – already needs to be restocked. I was in the mood for something more substantial than a mini chocolate bar. As I rooted in the pantry for an afternoon sweet, I discovered someone had returned the bag of iced molasses cookies to the shelf – empty. So of course, I immediately craved molasses cookies. 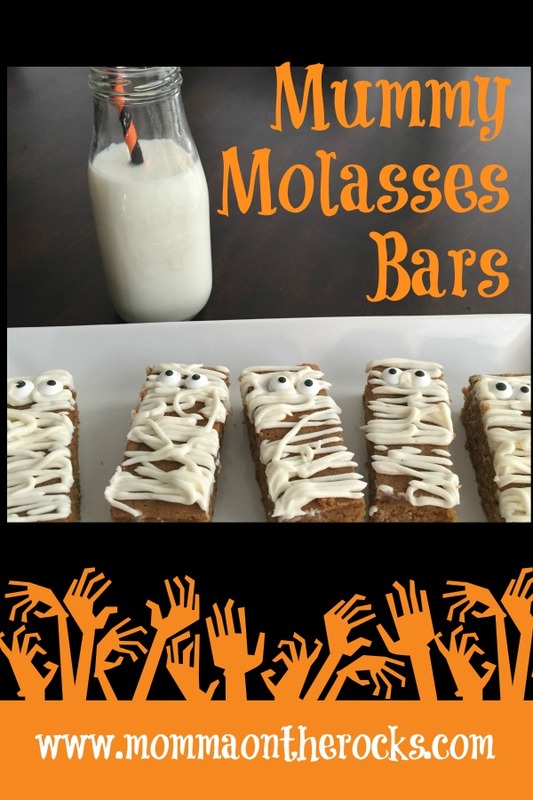 Poking through my recipe file, I came across an old recipe for molasses bars that I thought I could dress up for Halloween with a bit of creative icing to look like a cute mummy! If you are ready for a break from pumpkin anything (not that I don’t LOVE pumpkin everything), these mummy bars will fit the bill. The molasses flavor is very hearty and the icing provides a sweet counter to the bite of the molasses. Line a 9-by-13-inch baking dish with parchment paper (with a 1 inch overhang at the ends), folding in at corners so it lays flat against the side. Lightly coat paper with cooking spray. Preheat the oven to 350 degrees F.
Melt 2 sticks butter; let cool slightly. Beat until smooth. Whisk in 1/2 cup sugar, 1/2 cup brown sugar, 1/3 cup molasses, 3 eggs and 1 tablespoon vanilla. Stir in 2 cups flour, 2 teaspoons cinnamon, 1/4 teaspoon ground cloves and 1/4 teaspoon salt. Pour batter into the prepared pan. Bake until the edges are set but the center is soft, about 25 minutes. Cool in pan, then carefully lift the cake by the paper out of the pan. When cake is cooled, prepare icing. In a mixer, beat 1 cup of butter until creamy. Add in powdered sugar, vanilla and cinnamon; mix until combined and fluffy, scraping sides of bowl as needed. If mixture is too thick to spread, add a wee bit of milk to thin. Spoon icing into an icing bag with a writing tip or into ziplock bag, cutting of the tip of one corner. Cut into bars, then drizzle icing back and forth to look like a mummy wrapping. This was my daughter’s favorite part of the process! I ran a knife through the drizzles before separating the bars to create a clean edge. At this point, you have delicious molasses bars. Add candy eyes (I find them in the baking section of Target, Walmart, and Michaels during Halloween season) and you have MUMMY molasses bars. HOW FLIPPING CUTE ARE THEY! They are also really delicious and not too sweet. While they’re warm, pour yourself a big glass of milk and enjoy! Put room temperature, softened butter in a mixing bowl. Beat until smooth. Whisk in 1/2 cup sugar, 1/2 cup brown sugar, 1/3 cup molasses, 3 eggs and 1 tablespoon vanilla. Stir in 2 cups flour, 2 teaspoons cinnamon, and 1/4 teaspoon salt. Bake until the edges are set but the center is soft, about 25 minutes. Cool in pan, then remove for icing. When cake is nearly cooled, mix icing. Spoon icing into an icing bag with a writing tip or into ziplock bag, cutting of the tip of one corner. Drizzle icing back and forth, then cut into bars. (Alternately, you can cut into bars, drizzle the icing, then "recut" the icing for clean ends. Add candy eyes, pour a bit glass of milk and enjoy! Are you a molasses fan? If you try these mummy molasses bars, let me know what you think! If you liked these molasses bars, try my pumpkin cake!